The words in the Tibetan Uchen script style translate as "sacred calligraphy", 57x76cm, Chinese ink on high quality water colour paper. © Tashi Mannox 2010. Earlier this year the Contemporary Calligraphy Museum in Moscow invited Tashi to exhibit in their 2010 International Exhibition of 'Sacred' Calligraphy. This is to be held in the majestic Medieval City of Velikly Novgorod, considered one of the jewels in the crown of old Russia. Below a short vide was also made as part of the exhibition 'interactive' which shows the process of creating the above calligraphy. A stage by stage demonstration, from the proportional layout in relation to the italic brush width, the application of the calligraphy to finish with the signature and 'chop' seal impression. A more detailed explanation on the proportional construction of the Uchen script can be found here. 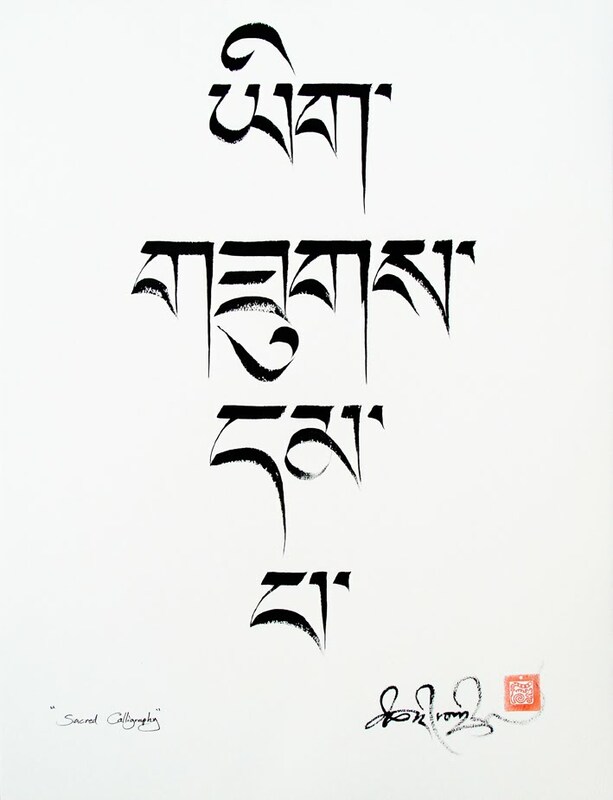 A short essay from the viewpoint of a Tibetan calligrapher, by Tashi Mannox. The definition of 'mantra' is a sound or collection of syllables that are considered capable of transforming the relative to the ultimate mind. Mantras are not just ordinary words written and spoken, but as they originate from an enlightened mind, such as a Buddha, they are considered sacred in their letterform and their quality of sound. Historically the divine proportions of the syllables originated in ancient Sanskrit and later translated into other sacred languages such as Tibetan. The Tibetan written language was developed to accommodate the migration of the Buddhist teachings from India, classified as Sutra and Tantra. The establishment and practice of these teachings was expressed in various art forms such as iconography and Calligraphy. Because Mantras are considered sacred and symbolic of an enlightened mind, there is much respect and veneration involved. There is a set code of correct proportions of the syllables, which is, not just pleasing to the eye, but also having the effect of ‘liberation through sight’, connecting the viewer to what is ultimately pure. The same can be said for the sound of the mantra, which on a deeper ‘vibration’ level has a metaphysical effect addressing balance in the body and mind. The act of writing a mantra can also be considered a meditation. 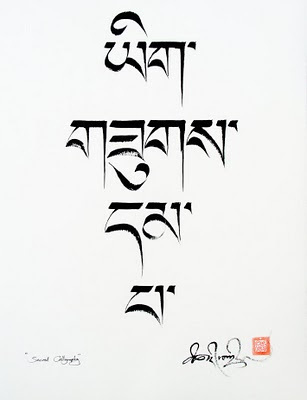 Once a calligrapher is fully established in the formal tradition of a calligraphy style, relying on this discipline, allows confidence in the freedom of expression to manifest in the very moment of creating the mantra; the deliberation of the calligraphy is best approached with a mind free of any bias. Indeed such a meditative approach can be applied to any form of calligraphy. What makes calligraphy sacred is not just a religious matter. The subject of the calligraphy should be from a divine source, the form of the lettering should be in respect to the spiritual tradition, and the approach in the creation of the calligraphy should be pure and meditative. This can then be called sacred calligraphy. The effect of a sacred calligraphy piece is to lift and inspire the viewer, to cause intrigue to investigate further, to connect and awaken.